These are just a few samples of the photos printed in "The Truth in the Teaching of Nuno Oliveira"
During the year spent in Avessada, Eleanor who had previously translated two of Nuno Oliviera's last books was given permission to take these unposed photos at any moment during training. Towards the year's end Nuno was shown a draft of the proposed book and gave his enthusiastic approval for the photos to be published in book form. WOW IT WORKED!! * He stayed a little bent around the left leg looking to the outside and his quarters were a little in off the track but he FELT in his own balance. HELP! IT DIDN'T HAPPEN * He just stays straight on track! Go back to the small circle and repeat the turn on the forehand / walking forward away from your left leg and imprint on YOUR mind what it FEELS like. Now repeat the same FEEL along the wall! HELP! IT DIDN'T HAPPEN * I used my inside leg and he bent but he kept on bending and fell out off the line. You forgot to stop using your inside leg and where was your outside rein? Remember to stop using your inside leg and straighten him with your outside rein but adjust / FEEL how much of an aid you need. * He didn't bend and fell in with his inside shoulder. You must correct this immediately. Do half a halt to get his attention and insist he moves / bends away from your inside leg as in the earlier exercise of one step sideways, one step forward. Don't expect the line to remain a good serpentine while doing this correction. The priority is he HAS to accept that inside leg and bend a little. 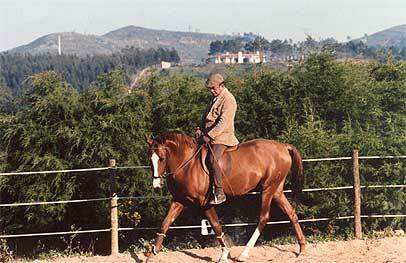 * He began to trot. He misinterpreted your aids. 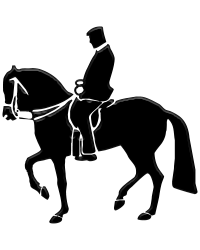 You must flex and relax your fingers a little to reduce his desire to trot, but give to allow him to still go forward while bending along the line. 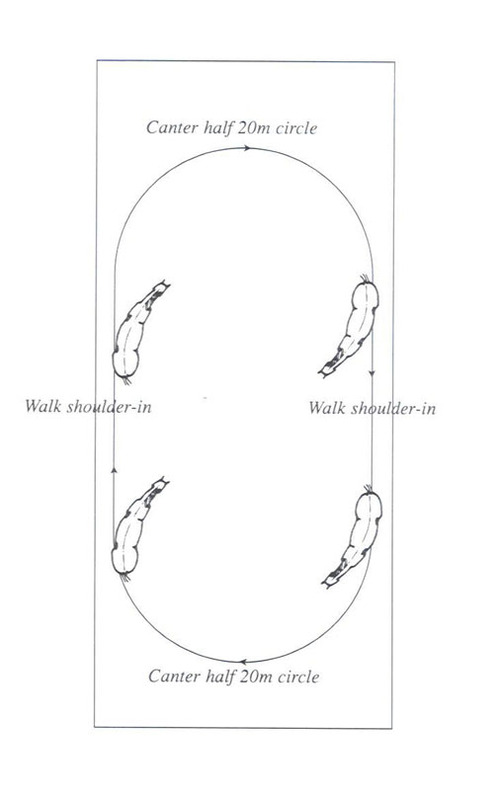 I first saw this exercise at Saumur and found it's a good and easy way to teach the transition. Your horse is already bending around your inside leg with his inside hind leg underneath him. Your aids are the same as for your canter strike off from trot. Sit down using your back and feeling your seat bones as you sit deeper in the saddle and touch with your outside leg. Close your fingers, don't pull back and, as he knows these aids, his back will round. He will feel like a round beach ball underneath you and he will canter from behind, from his hindquarters. WOW! He did it! * It felt marvellous, round and calm. We just cantered to the other side, I took a deep breath and as I relaxed deeper in the saddle letting my breath out, I flexed my fingers and he walked and I was able to immediately begin the next shoulder-in at walk. HELP! It didn't happen! * He trotted and wouldn't canter. Go back to the beginning, same side of the arena and give your aids a little stronger. 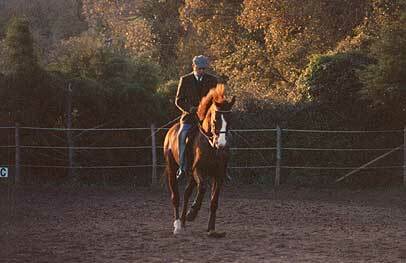 Remember to sit up and in and not lean forward into canter.